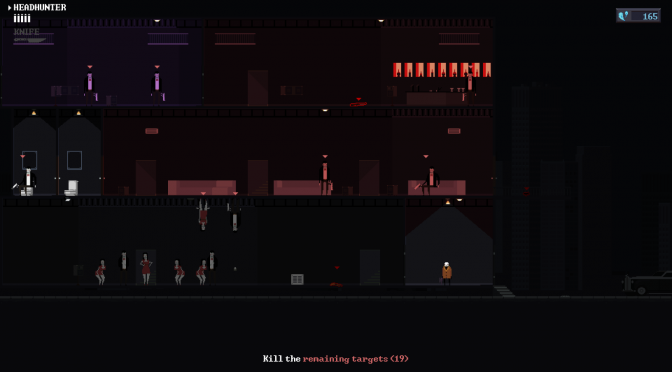 I’ve been playing Hopoo Games’s Deadbolt lately and thorougly enjoying it. I just barely beat Capter 2 Level 1, and 2:2, to me, looks almost impossibly difficult (ended up beating it while writing this. –ð). Attempting this level is certainly going to result in me being gunmurdered by vampires many, many times (it did. –ð), and yet, I’m excited for it. Why do we like hard games? What is driving me to persist through failure after failure? I think it has something to do with the way games structure their challenges, and the ways in which human beings pursue self-development. I don’t think these are hard and fast categories (I’m not a big fan of perscriptive categories in general), but for the purposes of this particular line of inquiry, I think there’s a big distinction between open-solution and closed-solution games. Both feature goal completion objectives, but open-solution games provide the player with a variety of options as to how to achieve a goal, while closed-solution games present a single path forward that must be followed with little to no deviation. (Puzzles are technically closed-solution games in this model). Playing open- and closed-solution games begins the same way: with strategic analysis. Strategy is all about the big picture: assessing the state of the situation and sussing out resources and complications. Once you’ve wrapped your head around the big picture, you decide on an angle of approach, which allows you to narrow in on tactical analysis: planning your first move, and anticipating the reactions to and consequences of that first move. Every time you play a game, you get better at both big-picture strategy and nitty-gritty tactics; even if you lose, you learn something. For me, that incremental skill-building is part of the appeal of hard games. I love the process of assessing a challenge, and I’ve found that that process is absolutely applicable outside of games, particularly in high-pressure situations like emergency response. What comes next? A lot of the time, it’s trial and error, and here’s where we get the deviation between closed- and open-solution games. In closed-solution games, trial and error brings you to a clearer understanding of the correct path forward; from there, the game becomes about the execution of that path. Closed-solution games appeal to a lot of people because there’s often a high degree of skill required to complete them. In the case of Rubik’s cubes, crossword puzzles, or strategy games, the skill required is almost entirely mental, but for some hard video games (and many athletic games), proper execution involves the development of muscle memory and twitch reflexes, and is as much a physical challenge as a mental one. In contrast to the linear approach of closed-solution games, playing an open-solution game often involves going back to the analysis stage and planning out a whole new angle of approach, and trial and error becomes a much more central element of gameplay. Open-solution games tend to reward expansionist or lateral thinking and creative approaches to their challenges. Open-solution games also tend to react more strongly to player input of any sort, and often involve a degree of unpredictability that makes it very difficult to formulate a single strategy that works every time. There’s plenty of left brain/right brain pop psychology that could fit in here (I do wonder if closed-solution games appeal more to “math kids” than open-solution games, and vice-versa). Ultimately, though, I’m only qualified to speak to the inner workings of one brain in particular–and oh boy, does mine love open-solution games. Games like Borderlands, Dishonored, and Bastion that let me customize the way I play tend to be my favorites, so when games like Dark Souls, Hotline Miami, and Monaco take that desire for a bespoke player experience and crank up the difficulty, I relish the ability to approach their challenges from a multitude of angles. Sometimes, these games dip into closed-solution approaches, and often, I can roll with them, but sometimes, they can make or break a game for me; I never finished Dark Souls 2 because the game presents you with a choke point most of the way through its story where you have to beat an extremely difficult boss in a large, empty room devoid of cover or interesting environmental features. Your options dwindle until you’re left with full frontal assault, and your survival becomes contingent on learning the boss’s attack patterns. I’m really not a fan of games require you to learn and exploit patterns, which is why I haven’t progressed through Undertale. I’d much rather solve a problem with creative use of my tools and environment, or by trying another strategy entirely. There’s another activity that engages me in the same way as a hard open-solution game: diving headlong into a genre of music I’m unfamiliar with with the goal of finding some new favorites. I have a little generalist music knowledge, but most of what I know is pretty specific to a few subgenres. Those styles are familiar ground, and while it’s fun to explore deep into the back catalogues of obscure labels or investigate the early work of my favorite bands, I really enjoy the experience of immersing myself in a new musical style that I don’t have the language for, trying to absorb new pieces of work on their own terms and place them in my growing context of the narrative or spatial quality of the style. In the game metaphor, I’ve spent some time acquiring a deep body of knowledge of a small sample of related subjects, memorizing the patterns and techniques of the subjects as I do so. But sometimes, it’s fun to leave much of that knowledge behind and explore a vast open world of possibility, picking up terminology and other tools along the way as I do so, with the eventual goals of broadening and refining my taste. Because the knowledge base I usually rely on doesn’t apply to these new subjects, my process for achieving the goal is different; I’m much less likely to analyze a specific quality of the subject and more likely to jump around within it to find the stuff that makes me think. Maybe some day, I’ll find the specific qualities of the new subject that really resonate with me, and I’ll dig deep into them and build a new knowledge base. For me, it all boils down to that need to experiment, to try new approaches. For some, it’s about mastery, about the knowledge of the core principles of what makes a thing tick. How lucky we are, that these things intermingle, and that we aren’t stuck with one or the other! How enticing, to be presented with a challenge.